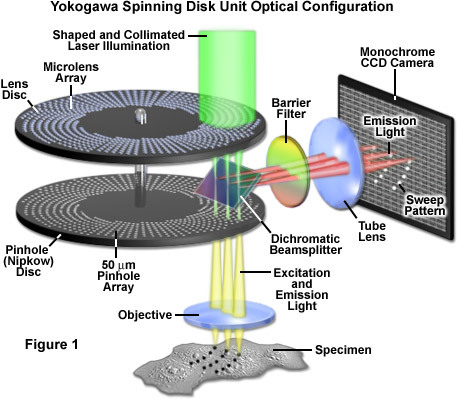 Spinning disk confocal microscopy (e.g. via a “Nipkow” disk) focuses the excitation laser through a series of many pinholes on a rapidly rotating disk to accelerate the scanning process. However, this generally causes a partial loss of “confocality” relative to conventional CLSM. Spinning disk confocal microscopes generally employ CCD cameras to generate images, rather than PMTs, and some cannot simultaneously scan multiple fluorophore colors.